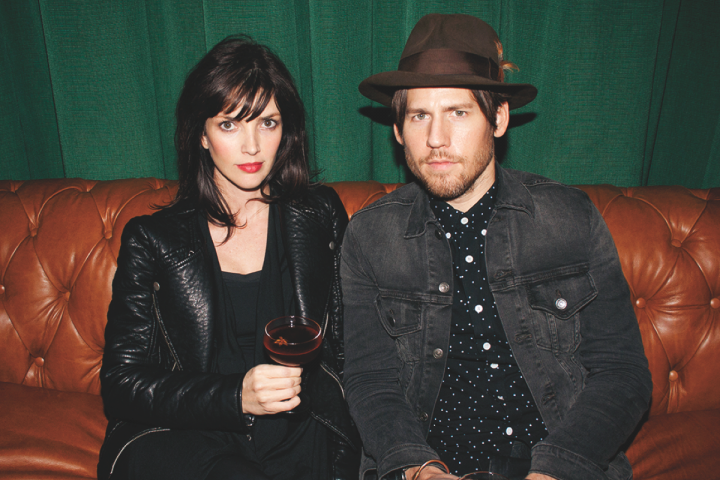 Texas isn’t known as a top mixology market, but Chad Solomon and Christy Pope are working to change that perception with Midnight Rambler, a sophisticated cocktail lounge in The Joule Hotel in Dallas. The pair cut their teeth at top New York City bars like Milk & Honey, Pegu Club and Flatiron Lounge before founding cocktail catering and consulting group Cuffs & Buttons with the late mixologist Sasha Petraske. “Our Dallas client Consilient brought us here to open Midnight Rambler,” Solomon says. The chance to shape the growing cocktail tradition in Texas was part of the appeal. The venue is committed to inventive mixology and even has a centrifuge and other specialized equipment. “We don’t have any classics on the menu,” Solomon explains. “We offer conceptual cocktails that highlight one or two flavors with laser-like focus.” Whiskey cocktails like the Bobby Keys ($16)—made with Balcones #1 single malt Texas whiskey, cold-smoked Punt e Mes vermouth, Bénédictine liqueur, Varnelli Amaro Dell’Erborista and lemon zest—are available year-round. Aperitif and digestif cocktails, aromatic stirred drinks, and punches all have a regular place on the list too. Midnight Rambler has also developed signature recipes like egg sours, sparkling cocktails and Pimms Cup–style fruit cups. “All these categories have their loyal fans,” Solomon says. 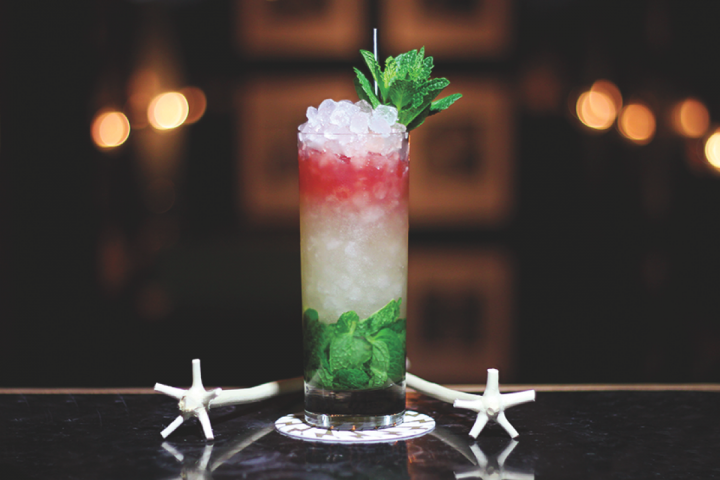 Other drinks, such as the Asbury Park Swizzle ($12), play on the classics. “It’s a Mr. Potato Head twist on a Queens Park Swizzle, built on the interplay between unaged apple brandy and orange blossom honey,” Solomon explains. Sparkling cocktails feature a wine base with additional complementary flavors layered on top. 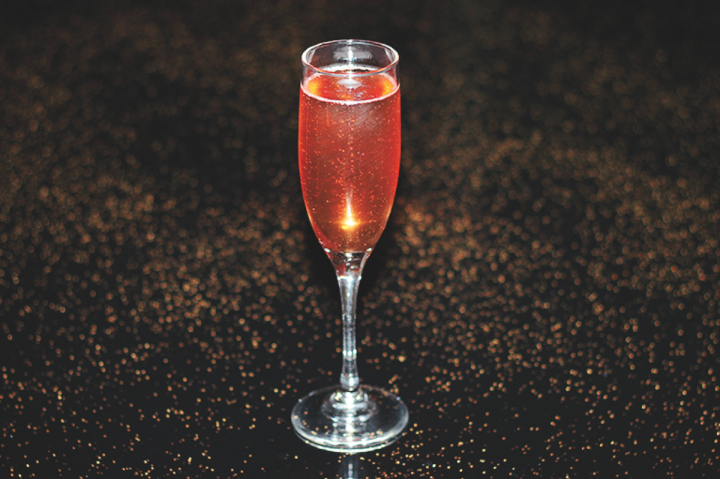 The Velvet Goldmine ($14), which Solomon created with head bartender Zach Smigiel, features sparkling rosé enhanced by aromas of birch, fir and pear. Cocktails at Midnight Rambler rotate seasonally, and Solomon and Pope enjoy the continual reinvention. “There are infinite possibilities,” Solomon says. 3 ounces Albert Bichot Crémant de Bourgogne sparkling rosé. Combine schnapps, vermouths, syrup, eau-de-vie, saline, bitters and birch extract. Stir and strain. Top with rosé. Serve up in a flute glass. 1Combine 1 part kosher salt with 9 parts mineral water. Muddle mint sprig with lemon juice and honey syrup in a shaker. Add brandy, liqueur and saline. Pour into a Collins glass and fill 7⁄8 of the glass with nugget ice. Add bitters and swizzle lightly. Top with nugget ice and garnish with a mint sprig. 1 Combine 2½ parts orange blossom honey with 1 part Texas Crazy Water #4 by weight. 2 Combine 1 part kosher salt with 9 parts mineral water. 3Combine equal parts Angostura, Peychaud’s and Dale Degroff’s Pimento aromatic bitters.